3:55pm EST - The devblog and update are out! 11:15am EST - It is update day and we’re seeing some big changes to a key factor of survival: Hydration. Not a huge update feature-wise given the freeze fix patch went live earlier this week (details here), however, surviving in the wild is getting a bit more complicated. Players are now able to drink freely from any body of water by pressing ‘E’. Mind where you’re drinking though, a big gulp of salt water will cause you to throw up and lose hydration and calories quickly. Therefore, when drinking in the wild, make sure you’re pulling from a stream or inland body of water. A new way to store water has been added: The water jug. Like the water bottle, it is found in loot throughout the map and cannot be crafted. With a 750ml capacity, it holds significantly more than the water bottle (100ml) or bota bag (300ml). Speaking of capacity, the water barrel now holds double what it previously did (20,000ml). In the same vein, the bota bag is now a default blueprint and cheaper to craft. It now costs 15 cloth, takes 20 seconds to craft, and can be filled up in rivers and lakes (by holding right click). Bleeding out will take a bit longer as the damage dealt by bleeding has been lowered. After the addition of the new arrow head model earlier this week, the alignment on the crossbow was a bit off kilter. 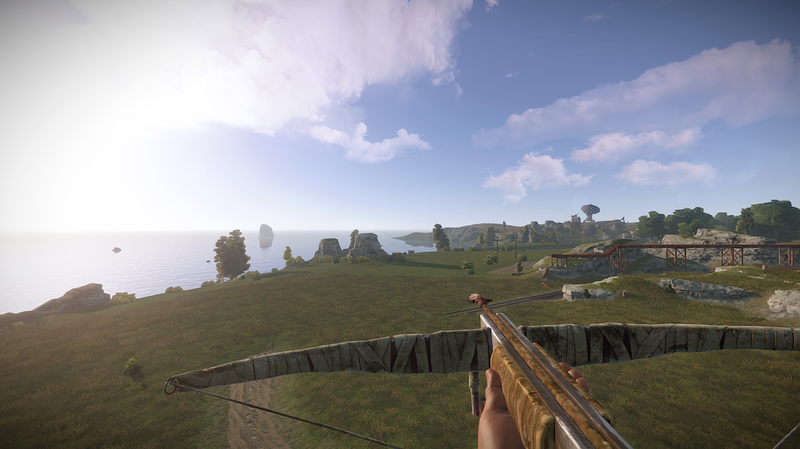 This has been fixed with this update, and the arrow now lines up properly with the crossbow. Edit: The new arrow heads have been taken out for the time being. Type 'benchmark' in console (when not in a server!) - cool stuff happens. In preparation for the update today, I've made some VIP slots available. Supplies are limited, so get them while they're hot!